Methods: A systematic review of MEDLINE for prospective studies that used at least 2 signs, symptoms, or point-of-care tests to determine the likelihood of CAP. We included studies that enrolled adults and adolescents in the outpatient setting where all or a random sample of patients received a chest radiograph as the reference standard. We excluded retrospective studies and studies that recruited primarily patients with hospital-acquired CAP. Results: Our search identified 974 articles, 12 of which were included in the final analysis. The simple heuristic of normal vital signs (temperature, respiratory rate, and heart rate) to identify patients at low risk for CAP was reported by 4 studies and had a summary estimate of the negative likelihood ratio (LR−) of 0.24 (95% CI, 0.17 to 0.34) and a sensitivity of 0.89 (95% CI, 0.79 to 0.94). The simple heuristic of normal vital signs combined with a normal pulmonary examination to identify patients at low risk for CAP was reported by 3 studies, and had a summary estimate of LR− of 0.10 (95% CI, 0.07 to 0.13) with an area under the receiver operating characteristic curve of 0.92. Conclusions: Adults with an acute respiratory infection who have normal vital signs and a normal pulmonary examination are very unlikely to have CAP. Given a baseline CAP risk of 4%, these patients have only a 0.4% likelihood of CAP. The recommended test for diagnosing CAP is by chest radiograph (CXR).4 However, obtaining a CXR in all outpatients with acute cough would be costly, inconvenient, and would expose many patients to radiation unnecessarily. A way to limit unnecessary testing of these patients is by stratifying risk of CAP based on the clinical presentation. Patients identified as low risk for CAP could avoid the need for CXR and antibiotics, reducing overall health system costs, antibiotic use, and unnecessary radiation exposure. While the use of signs and symptoms to diagnose CAP has been well studied,6⇓⇓–9 the focus has generally been on diagnosing CAP rather than on ruling it out. For the outpatient primary care physician, especially one who does not have ready access to chest radiography, the question of ruling out CAP is equally relevant. In this study, we systematically reviewed the literature to identify CDRs that may be used to rule out CAP in otherwise-healthy adults, also known as “low-risk criteria” for CAP. Our goal is to identify the combination(s) of signs (including vital signs), symptoms, and POC tests with the lowest negative likelihood ratio (LR−), to help physicians confidently rule out CAP without having to obtain a CXR in the outpatient setting. Our search was designed to identify studies that used a CDR to diagnose, predict, or rule out CAP in the outpatient setting. A study was included if it used a CXR or computed tomography scan as the primary reference standard and was given to all patients enrolled in the study. If the reference standard was used in a random or systematic sample of low-risk CAP patients to minimize radiation exposure, the study was also included. Studies had to gather data prospectively and only studies that recruited adults or adolescents in an outpatient setting (emergency department, urgent care, primary care, or outpatient clinic) were included. Studies where a majority of the enrolled patients had hospital-acquired or ventilator-associated pneumonia, were immunocompromised, or that were conducted in special populations such as military or nursing homes were excluded. We excluded studies that were not prospective, such as case-control studies, case reports, and outbreak investigations. An exception was made if the case-control study enrolled symptomatic patients prospectively, such as a consecutive series where patients with similar symptoms but with and without CAP were matched. We performed a systematic review of articles published in MEDLINE from inception to January 2017 (Appendix A). Any systematic reviews that appeared in our results were reviewed for relevant articles that fit our inclusion and exclusion criteria. We also searched the reference lists of any article that were reviewed in full text form. Each author independently reviewed the titles and abstracts to identify any articles that required a full text review. Any article identified by at least 1 reviewer had its full text reviewed. The full text review and all data abstraction methods described hereafter were performed independently, in parallel, by 2 authors with a third author who helped resolve any discrepancies. We used the Preferred Reporting Items for Systematic Reviews and Meta-Analyses (PRISMA)10 to document our search process. We first abstracted the study characteristics, including the combination of signs, symptoms, or POC tests that were used to diagnose CAP. Articles were assessed for bias using the Quality Assessment Tool for Diagnostic Accuracy Studies (QUADAS-2) framework adapted for our study.11 The evaluation consists of 4 areas: patient selection, index test, reference standard, and flow and timing. For each, a set of questions assess the article for bias, answering yes, no, high, low, or unknown. A final overall assessment for each article was given a low, moderate, or high risk for bias. Lastly, we calculated 3 risk groups (low, moderate, and high) as part of a post-hoc analysis of any CDR that was based on a multichotomous score.6,7 The risk groups were assigned based on the distribution of likelihood ratios from the studies' published data. Institutional Review Board approval was classified as exempt as this was a secondary analysis of previously published data, and no funding was provided for this research. PRISMA flow diagram of search strategy and selection of articles. Study characteristics are summarized in Table 1. Almost half were performed in the United States6,7,14,16,20 and no other country appeared more than once. Enrollment of patients occurred from 1984 to 2010, with a mean age between 32 and 65 years. Six studies were performed in the emergency department setting and the other 6 in primary care. Sample sizes ranged from 246 to 2820 patients. The QUADAS-2 assessment of bias for the 12 studies is presented in Appendix B1. Overall, 6 studies were determined to be at low risk of bias and the other 6 at moderate risk of bias. Those that were moderate risk were only included after consideration of their limitations.6,14,16,17,20,21 Two were case control studies16,21 but enrolled patients prospectively in a consecutive series, and a CXR was performed on each patient. In 1 study,17 not all patients received the reference standard CXR; those with a low probability of CAP were randomized to receive one or not. The final 3 studies that we included6,14,20 enrolled patients when a CXR was ordered because pneumonia was suspected or the physician considered the probability of pneumonia to be greater than zero. We chose to accept this limitation because we are interested in when it is appropriate to order a CXR for CAP in this clinical situation. Studies evaluated CDRs with between 3 and 10 elements (Appendix B2). The 4 individual signs or symptoms that appeared in at least half of the studies were elevated temperature, elevated heart rate, crackles on auscultation, and decreased breath sounds. Elevated temperature was the most common shared sign or symptom, found in 10 of the 12 studies. The definition of elevated temperature was not consistent, with some using greater than 37.8°C, some greater than 38.0°C, and 2 described as just “fever.” The other 3 signs or symptoms were used in 6 studies. Three studies evaluated a simple point score (see Appendix B3 for calculation of the scores, which had varying points assigned to each of the symptoms). These scores and their classification of patients into post hoc low-, moderate-, and high-risk groups is summarized in Table 2.6,7,9 In the study of Diehr and colleagues,7 patients with a score from −3 to 0 had a SSLR of 0.47, and a 1.2% probability of CAP given a baseline prevalence of 2.6%. The high-risk group had a 27.3% probability of CAP and a SSLR of 14.0. Heckerling and colleagues6 used a derivation set (Illinois) to develop a point score and then validated it with data from 2 other locations (Nebraska and Virginia). The Illinois derivation set had an AUROCC of 0.82 (95% CI, 0.78 to 0.86), while the Nebraska and Virginia validation sets had AUROCCs of 0.82 (95% CI, 0.74 to 0.90) and 0.76 (95% CI, 0.66 to 0.86), respectively. Low-, moderate-, and high-risk groups were created post hoc for the derivation set and validation set, and were pooled for the entire study. Overall, patients presenting with no or 1 abnormal finding in the pooled set had a low risk of CAP, with a probability of 4.0% given a baseline prevalence of 29.2% and a SSLR of 0.19. The high-risk group with 4 or 5 abnormal findings had a 64.0% probability of CAP and a SSLR of 8.3. The study by Van Vugt9 and colleagues incorporated a POC test, c-reactive protein (CRP). The overall model had an AUROCC of 0.77 (0.73 to 0.81). The low-risk group with a score of zero, had 0.7% probability of CAP given a prevalence of 5.2%, with a SSLR of 0.14. The SSLRs for moderate and high-risk groups were 0.76 and 4.3, respectively. Normal vital signs accompanied by no findings on a pulmonary examination rules out CAP well, with 3 studies of this CDR having LR−s 0.09 to 0.11.15,16,21 A meta-analysis of the 4 studies that reported normal vital signs15,16,20,21 as low-yield criteria for CAP had a summary estimate of sensitivity of 0.89 (95% CI, 0.79 to 0.94) and a summary LR− of 0.24 (95% CI, 0.17 to 0.34) (Table 3). The summary receiver operating characteristic (ROC) curve (Appendix C) has good discrimination and a narrow confidence interval, with an AUROCC of 0.89. For the studies reporting the combination of normal vital signs plus normal findings on the pulmonary examination to exclude CAP,15,16,21 the overall sensitivity was 0.96 (95% CI, 0.92 to 0.98) and the LR− 0.10 (95% CI, 0.07 to 0.13). The summary ROC curve for this CDR also had a narrow confidence range around the summary estimate, with an AUROCC of 0.92. In this systematic review, we identified 2 potentially useful low-risk criteria for use in the outpatient setting to identify patients at very low risk of CAP: normal vital signs, and normal vital signs plus normal pulmonary findings. The latter simple heuristic performed very well, with very high sensitivity (0.96), low LR− (0.10), and an AUROCC of 0.92. Only 1 study included a physician's overall clinical impressions as part of the CDR.19 It also included CRP and oxygen saturation, and had unhelpfully high LR− (0.35 to 0.74). Further study of the physician's overall clinical impression would be helpful, including studies to identify which components of the impression had the greatest impact on decision making. Of the 12 studies included, 3 were CDRs using a point score. For each rule, the low-risk group had a negative likelihood ratio less than 0.2. In a standardized low prevalence setting (4%), intended to simulate the prevalence of CAP among patients with acute cough in primary care, these scores would reduce the likelihood of CAP in the low-risk group to approximately 0.4% to 0.8% (Table 4). Only 1 of the 3 point scores,6 developed by Heckerling and colleagues, was externally validated, had a large sample size, and of all the CDRs produced in our review had the highest AUROCC. However, it has not been validated in over 20 years. Thus, validation of these CDRs in a contemporary population of patients with acute lower respiratory tract infections or clinically suspected CAP would be helpful. The use of “big data” and machine learning methods with electronic health records (EHRs) will likely be important in the future.22,23 Although EHRs contain a vast amount of patient data, they are often incomplete and are unable to automate the CDR.24 The CDRs found in this systematic review (normal vital signs or normal vital signs and normal pulmonary examination) are simple and allow a physician to quickly rule out CAP and avoid unnecessary CXRs without the need of access to an EHR or other algorithms. These quick decisions are valuable in high turnover settings such as emergency departments or urgent care, which are also where physicians are more likely to encounter adults with a cough. We are primarily limited by the quality of the included studies, with half of the included studies judged to be a moderate risk of bias. To limit this impact, we only included prospective studies where all participants received the same reference standard. In addition to using MEDLINE, we also reviewed other systematic reviews, the references of included articles, and ran a Google search to assure completeness of the search. The simple heuristic of normal vital signs and normal pulmonary examination greatly reduces the likelihood of CAP in outpatient with acute cough illness (LR−, 0.1). Clinicians can use this to confidently identify patients with acute cough who do not require a CXR, in the absence of other factors such as signs of malignancy or prolonged symptoms. A simple heuristic that also incorporates CRP is promising, as are several point scores,6,7,9 but these require prospective validation in contemporary outpatient populations. (“clinical criteria”[TIAB] OR “diagnostic value” [TIAB] OR “predictive value”[TIAB] OR “rule out”[TIAB] OR decision[TIAB] OR prediction[TIAB]) AND (“pneumonia”[MeSH Terms] OR pneumonia[TIAB] OR pneumoniae[TIAB]) AND (community[TIAB] OR emergency[TIAB] OR urgent[TIAB] OR primary[TIAB] OR acute[TIAB] OR “general practice”[TIAB]) NOT (“hospital-acquired”[TIAB] OR “hospital-associated”[TIAB] OR “healthcare-associated”[TIAB] OR nosocomial[TIAB] OR stroke[TIAB] OR klebsiella[TIAB] OR tuberculosis[TIAB] OR surgery[TIAB] OR ventilator[TIAB] OR “intensive care unit”[TIAB] OR “ICU”[TIAB] OR retrospectively[TIAB] OR retrospective[TIAB] OR “case-control”[TIAB] OR “case report”[TIAB] OR “case series”[TIAB] OR gastrointestinal[TIAB] OR immunocompromised[TIAB] OR HIV[TIAB] OR cancer[TIAB]) AND hasabstract[text]. Summary Receiver Operating Characteristic Curves for Clinical Decision Rules Using any Abnormal Vital Signs (A), and Any Abnormal Vital Sign and Abnormal Pulmonary Exam (B) to Diagnose (Rule in) Community Acquired Pneumonia. To see this article online, please go to: http://jabfm.org/content/32/2/234.full. Received for publication July 31, 2018. Revision received October 23, 2018. Accepted for publication October 24, 2018.
. Most Frequent Conditions in U.S. Hospitals, 2011: Statistical Brief #162. In: Healthcare Cost and Utilization Project (HCUP) Statistical Briefs. Rockville, MD: Agency for Healthcare Research and Quality (US); 2006.
. Community-acquired pneumonia requiring hospitalization among U.S. adults. N Engl J Med 2015;373:415–427. CDC. Deaths: Final Data for 2015. National Vital Statistics Report. Available from: https://www.cdc.gov/nchs/data/nvsr/nvsr66/nvsr66_06_tables.pdf. Accessed February 16, 2018.
. Infectious Diseases Society of America/American Thoracic Society consensus guidelines on the management of community-acquired pneumonia in adults. Clin Infect Dis 2007;44(Suppl 2):S27–S72.
. The diagnosis of strep throat in adults in the emergency room. Med Decis Making 1981;1:239–246.
. Clinical prediction rule for pulmonary infiltrates. Ann Intern Med 1990;113:664–670.
. 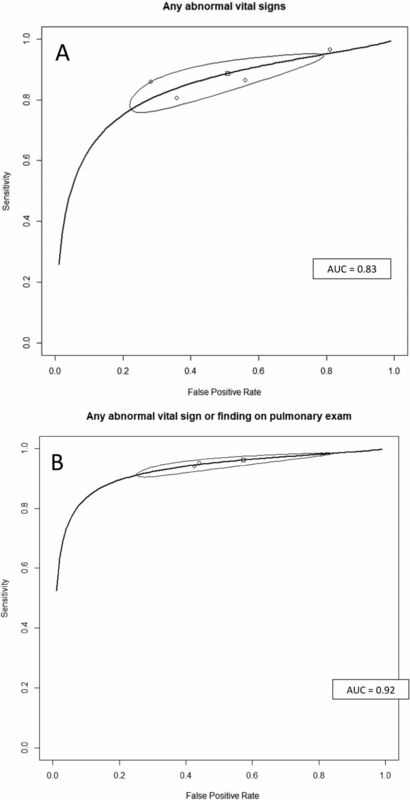 Prediction of pneumonia in outpatients with acute cough—A statistical approach. J Chronic Dis 1984;37:215–225.
. A decision aid to rule out pneumonia and reduce unnecessary prescriptions of antibiotics in primary care patients with cough and fever. BMC Med 2011;9:56.
. Use of serum C reactive protein and procalcitonin concentrations in addition to symptoms and signs to predict pneumonia in patients presenting to primary care with acute cough: Diagnostic study. BMJ 2013;346:f2450.
. Preferred reporting items for systematic reviews and meta-analyses: the PRISMA statement. J Clin Epidemiol. 2009;62:1006–1012.
. QUADAS-2: A revised tool for the quality assessment of diagnostic accuracy studies. Ann Intern Med 2011;155:529–536.
. Diagnosing pneumonia in patients with acute cough: Clinical judgment compared to chest radiography. Eur Respir J 2013;42:1076–1082.
. Bivariate analysis of sensitivity and specificity produces informative summary measures in diagnostic reviews. J Clin Epidemiol 2005;58:982–90.
. Decision rules and clinical prediction of pneumonia: Evaluation of low-yield criteria. Ann Emerg Med 1989;18:13–20.
. [Predictive value of history and physical examination for the diagnosis of community-acquired pneumonia in adults]. 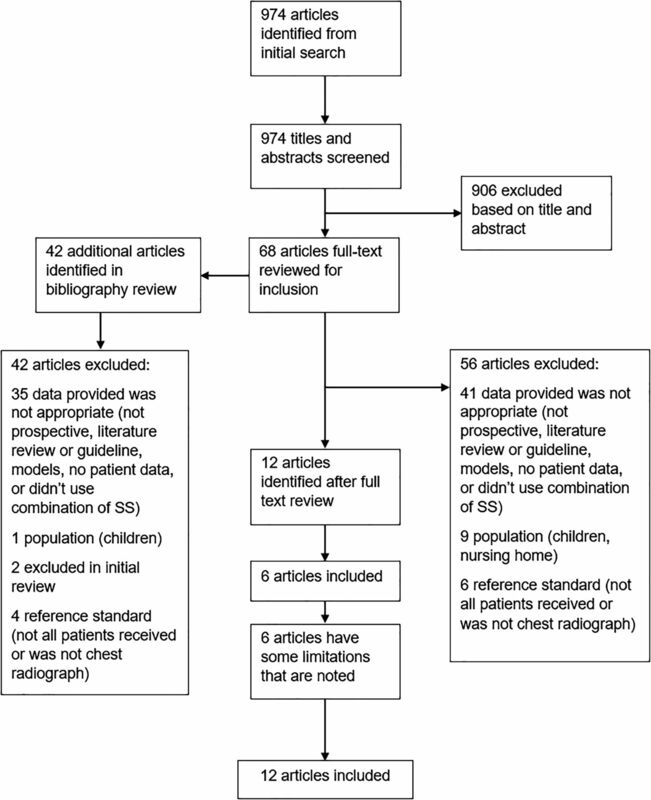 Revista Med Chile 2007;135:143–152.
. Clinical indicators of radiographic findings in patients with suspected community-acquired pneumonia: Who needs a chest x-ray? J Am Coll Radiol 2006;3:703–706.
. Diagnosis of pneumonia in adults in general practice. Relative importance of typical symptoms and abnormal chest signs evaluated against a radiographic reference standard. Scand J Prim Health Care 1992;10:226–233.
. Contributions of symptoms, signs, erythrocyte sedimentation rate, and c-reactive protein to a diagnosis of pneumonia in acute lower respiratory tract infection. Br J Gen Pract 2003;53:358–364.
. Aetiology and prediction of pneumonia in lower respiratory tract infection in primary care. Br J Gen Pract 2007;57:547–554.
. Clinical criteria for the detection of pneumonia in adults: Guidelines for ordering chest roentgenograms in the emergency department. J Emerg Med 1989;7:263–268.
. Clinical and laboratory findings in patients with acute respiratory symptoms that suggest the necessity of chest x-ray for community-acquired pneumonia. Iran J Radiol 2015;12(1):e13547.
. The inevitable application of big data to health care. JAMA 2013;309:1351–1352.
. Predicting the future—Big data, machine learning, and clinical medicine. N Engl J Med 2016;375:1216–1219.
. Assessment of the feasibility of automated, real-time clinical decision support in the emergency department using electronic health record data. BMC Emerg Med 2018;18:19.